Technical analysis strategies are used to forecast future price moves by analyzing past and current market action. Unlike fundamental analysts – who evaluate a security’s intrinsic value – technical analysts use price charts and various analytical tools – including technical indicators and chart patterns – to evaluate a security’s strength or weakness and predict future price changes. Prices already reflect, or discount, relevant information. As a result, technical analysts believe historical market action can be analyzed to forecast future price moves. Of course, the effectiveness (and profitability) of any technical-analysis strategy ultimately depends on the quality of the analysis and the investor’s ability to respond to the results. What Type of Investor uses Technical Analysis? Pure technical analysts couldn't care less about the elusive intrinsic value of a company or any other factors that preoccupy fundamental analysts, such as management, business models or competition. Technicians are concerned with the trends implied by past data, charts and indicators, and they often make a lot of money trading companies they know almost nothing about. Is Technical Analysis a Long-Term Strategy? If a stock does not perform the way a technician thought it would, he or she wastes little time deciding whether to exit his or her position, using stop-loss orders to mitigate losses. Whereas a value investor must exercise a lot of patience and wait for the market to correct its undervaluation of a company, the technician must possess a great deal of trading agility and know how to get in and out of positions with speed. An important concept in technical analysis is support and resistance, which is essentially a display of supply and demand. 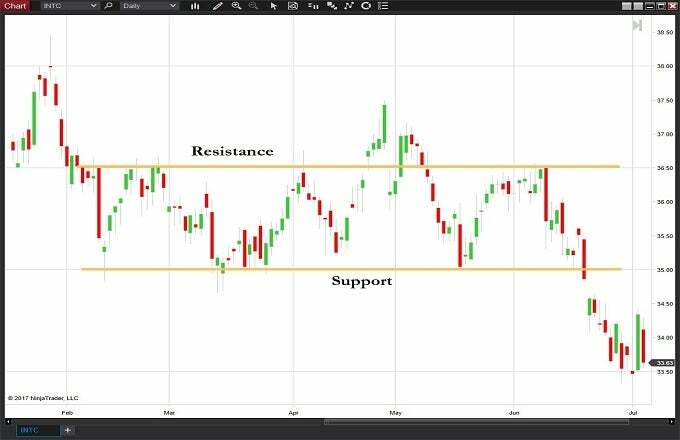 (See The The Psychology of Support and Resistance Zones for more.) Technical analysts use support and resistance to identify points on a chart where a pause or a reversal of the prevailing trend is likely to occur – events that can signal a trading opportunity. That’s because as price reaches a point of support or resistance, it will do one of two things: bounce back from the support or resistance level, or push through the price level and continue in its direction. Either way, traders can “bet” on the direction and quickly find out if they are correct. If price moves in the wrong direction, the position can be closed at a small loss. If price moves in the right direction, however, the move may be substantial. The following screenshot shows a daily chart with areas of support and resistance, drawn in yellow. There are hundreds of technical indicators available to technical analysts, ranging from time-tested indicators in the public domain (such as a moving average or RSI) to commercially available proprietary indicators. Technical analysts can even develop their own unique indicators, sometimes with the help of a qualified programmer. Whether a technical indicator is in the public domain or something you buy, it will fall into one of the four basic categories of technical indicators. The chart below shows these four types, along with examples for each. The screener displays the results – those stocks that meet the specific criteria – and the investor can then enter positions or continue monitoring the stock(s) for further confirmation. Technical analysis helps traders and investors navigate the gap between intrinsic value and market price by leveraging certain techniques. Here are five of the best books written on technical analysis to help traders and investors understand and apply technical analysis. Discover the best online courses for learning technical analysis concepts and how to apply them in the real world. Learn how to evaluate a stock with a few easy-to-identify chart patterns.